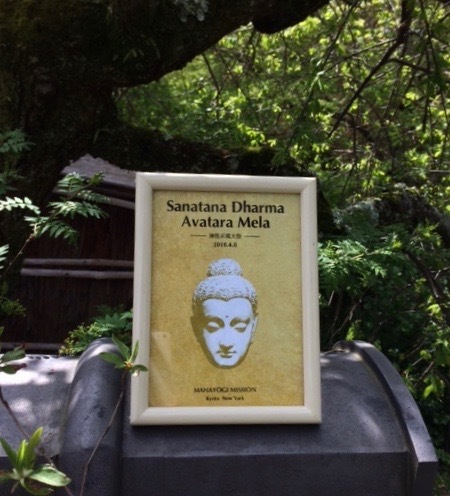 On April 8th, the auspicious holy birthday of the Awakened Being, Buddha, we celebrate the joyous occasion of Sanatana Dharma Avatara Mela (the Ceremony of Divine Manifestations), in which we think of both the Eternal Truth—Sanatana Dharma—which is beyond time and space, and the incarnations of God—Avatara—who have expressed the realization of this through their physical manifestation, with the conviction that their true Existence and grace saturate the entire universe and fill the essence of all living beings. According to the needs of every era, Avatara have provided various teachings and brought salvation to the people. Shakyamuni Buddha, the most familiar existence among them, established the path of meditation through Yoga and provided the universal teaching to this world that makes the realization of Satori possible for anyone. At this year’s festival, we would like to make this celebration into a wonderful opportunity for us to focus particularly on the divine existence of Buddha out of all the Avatara, to let our small minds melt away into His essence, the Truth Itself, and to see all the different existences and the entire universe through Buddha’s mind and through Buddha’s eyes. Buddha said, “I have found an ancient path, a straight and ancient road that has been traveled upon by past Awakened Beings.” Without having been taught by anyone, Buddha was convinced of the existence of Avatara in the past. He also felt that this blessed path left behind by such awakened predecessors was connected to his path. Through the existence of Buddha, may we, those of us who live in the current time, see the path—which has been shown by the Avatara, the god-incarnate, that is, the path toward universal Truth, Sanatana Dharma, which may not be visible to our physical eyes, yet is tangibly clear to the eyes of Truth—from a universal point of view, and tangibly feel that it is connected to us too.